Led by QB Aaron Rodgers, who earned the fifth-most votes overall in the recently concluded fan voting for the Pro Bowl, six Packers pulled in the most votes at their respective positions. The other position leaders in the NFC are FB John Kuhn, C Jeff Saturday, KR Randall Cobb, OLB Clay Matthews and SS Charles Woodson. Voting by the players and coaches has not yet been tabulated. Fan voting counts one-third in the selection process for the Pro Bowl rosters, which will be announced next Wednesday. As the top NFC QB, Rodgers finished fifth overall in the fan voting with 777,827 votes. Leading the way was Broncos QB Peyton Manning (993,045), followed by Patriots QB Tom Brady (980,099), Texans RB Arian Foster (829,591) and Vikings RB Adrian Peterson (828,255). CB Davon House returned to practice on Thursday after missing Wednesday’s workout with an illness. Also, DB Charles Woodson was back at practice, though he already has been ruled out for this week and won’t play in Sunday’s game. RB James Starks (knee), WR Jordy Nelson (hamstring) and DE C.J. Wilson (knee) all remain out of practice. LB Clay Matthews returned to practice on Wednesday for the first time since injuring his hamstring on Nov. 4 vs. Arizona. Matthews has missed the last four games, but it appears he could return to game action this Sunday in Chicago. Also, OL T.J. Lang (ankle) and DL Mike Neal (shoulder) also returned to practice after missing last week’s games. On the flip side, DB Charles Woodson was not at practice despite having practiced off and on the past couple of weeks. Woodson hasn’t played in a game since breaking his collarbone in Week 7 in St. Louis and it was thought he might return to action this week. Mike McCarthy should provide an update when he speaks with the media following practice at the top of the hour. Another defensive back, CB Davon House, was sitting out practice as well. House has not been on the team’s injury report since recovering from his preseason shoulder injury. WR Jordy Nelson also was not at practice. Nelson missed last week’s game with a hamstring injury, his second such injury this season. On another note, several of the offensive linemen and tight ends began practice with a little prank for their quarterback. Today is “Aaron Rodgers Day” in honor of the numerical date (12-12-12) and several of Rodgers’ offensive mates were wearing No. 12 Rodgers jerseys at the start of practice. Shortly into the workout, all had changed back to their regular jerseys, but for some of the initial jog-through snaps early in practice, as many as a half-dozen players running an offensive play had a No. 12 jersey on. With DE C.J. Wilson still out with a knee injury and DE Mike Neal added to the injury report on Wednesday with a shoulder injury, the Packers’ defensive line could be a bit thin come Sunday against the Lions. Mike McCarthy said he didn’t have a lot of information on Neal’s shoulder, but he didn’t “feel real good about what the medical staff told” him about Neal. That would indicate Neal’s chances of playing this week are slim, and if Wilson remains out, that would leave the Packers with only four healthy defensive linemen — B.J. Raji, Ryan Pickett and rookies Jerel Worthy and Mike Daniels. In other injury news, it sounds like rookie Don Barclay could get his first NFL start at right tackle in place of T.J. Lang, whose injured ankle is “not progressing the way he’d like,” according to McCarthy. Lang sat out practice on Wednesday. WR Jordy Nelson also sat out practice, as did LB Clay Matthews. Both have hamstring injuries, and McCarthy said he didn’t know if either would be ready to play this week and didn’t get into specifics. “I’m about timelined out,” McCarthy said. Veteran C Jeff Saturday was also added to the injury report with a foot injury. He was limited in practice, but McCarthy said he expects Saturday to be able to play against the Lions. In summary, the injury list doesn’t seem to be getting any shorter for the Packers, but they’re so used to dealing with it by now that the typical response is a shrug of the shoulders. The positive injury news came in the form of Charles Woodson’s return to practice from a broken collarbone. He was listed as limited on the injury report, the first time he has participated in practice since the injury, which occurred on Oct. 21 at St. Louis. The Packers will practice in pads on Thursday, and McCarthy didn’t say whether Woodson would go in pads, which would be the next step to returning to game action. Mike McCarthy suggested on Monday that veteran DB Charles Woodson could return from his broken collarbone in time for the Dec. 16 showdown in Chicago against the Bears. McCarthy added that more evaluations need to be done on Woodson, who has not yet been medically cleared. Woodson has been out since fracturing his collarbone on Oct. 21 at St. Louis. The upcoming Bears game would be eight weeks from the date of the injury, a standard timetable for a broken bone. 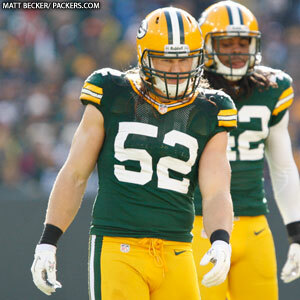 McCarthy gave no update on LB Clay Matthews, who has missed the last three games with a hamstring injury. He did say Matthews worked out in the Hutson Center on Monday but did not elaborate. WR Jordy Nelson, who left Sunday’s game with a hamstring injury, “felt something in pre-game, went back in the training room and tried to play through it,” McCarthy said. He did not expect to have Nelson this week but otherwise wasn’t overly concerned about the injury. It is the same hamstring Nelson injured earlier this season, which kept him out of one game. 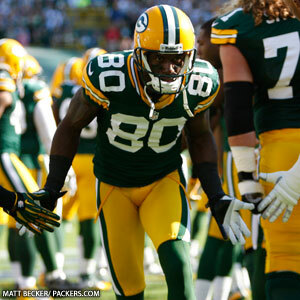 Nelson’s absence forced WR Greg Jennings to play 51 snaps in his first game back after missing seven contests. That’s far more than the coaching staff planned for Jennings, who had four receptions for 46 yards, including a crucial juggling catch over the middle to convert a third down on the Packers’ final scoring drive to seal the win. After further review: Having reviewed the game film, McCarthy said he could see why the official flagged CB Tramon Williams for an unnecessary roughness penalty for his hit on RB Toby Gerhart on a sideline pass in the third quarter, but he didn’t necessarily agree with the call. The Packers have had a number of penalties and/or fines for hits they didn’t necessarily believe warranted those punishments this season, but McCarthy said his staff will continue to coach the proper techniques. Any helmet-to-helmet contact on the plays in question hasn’t been intentional, McCarthy said. “I’m talking about Brad Jones (against Detroit), Ryan Taylor (against Arizona) and (Jerron) McMillian (against the Giants). We’ve had some tough calls go against us. You just have to continue to coach through that. The league has obviously made it a priority. The fines reflect that. Green Bay Packers QB Aaron Rodgers ranks fourth in the Pro Bowl voting amongst all NFL players, according to the league. Broncos QB Peyton Manning has the most votes, with 586,523, followed by Patriots QB Tom Brady (534,020), Texans RB Arian Foster (519,261), Rodgers (485,196) and Vikings RB Adrian Peterson (484,227). In addition to Rodgers, four other Packers lead the NFC voting at their respective positions. They are FB John Kuhn, C Jeff Saturday, OLB Clay Matthews and S Charles Woodson. Pro Bowl voting continues through Monday, Dec. 17, and counts one-third in the selection process for the annual all-star game. Fans can vote by clicking here. The Pro Bowl rosters will be announced at 6 p.m. CT on Wednesday, Dec. 26, on NFL Network’s “Total Access”. The 2013 Pro Bowl will be played on Sunday, Jan. 27, 2013 and televised live on NBC at 6 p.m. CT from Aloha Stadium in Honolulu, Hawaii. Mike McCarthy announced on Wednesday that LB Clay Matthews has been ruled out and will not play in Detroit due to his hamstring injury. “We’ll see what next week brings,” McCarthy said. He added that the team had been planning not to have Matthews this week. Also, WR Greg Jennings (groin/abdominal) and DB Charles Woodson (collarbone) remain out, but McCarthy said both players are farther along in their rehab and workouts than expected at this point. WR Jordy Nelson (hamstring/foot) was limited in practice, but McCarthy said he “looked like his old self” and doesn’t anticipate him having any problems playing. Nelson missed the Jacksonville game with the hamstring injury and then injured his foot and/or ankle early in the Arizona game and was taken out again. DE Mike Neal (ankle) did not participate in practice because the ankle injury he played through against Arizona is “bothering him,” according to McCarthy, who is hoping Neal might be able to practice at some point later this week. Packers safeties Morgan Burnett and M.D. Jennings addressed the pending long-term absence of veteran leader Charles Woodson on Monday, and though they’re confident the defensive backfield will be ready to play, they acknowledged there will be something missing without Woodson on the field. “He really means a lot,” Burnett said. “He’s one of those guys you look up to. Just from what I’ve seen when I first got here, he’s a real pro. He carries himself very well on and off the field, and to see the little things he does around here as far as working out, studying, getting prepared for opponents, and just seeing his play on the field speaks for itself. Burnett said what could be missed the most are just the little things Woodson would notice during a game that he would alert his teammates to. In theory, Woodson will still be able to provide that help in the film room and from the sideline, but it won’t be the same as having him in the huddle. The leadership is most likely going to fall on multiple players, not one individual to fill the void. “We’re all leaders of some sort,” Jennings said. “If we see something the next guy doesn’t see, we’ll call it out or give it a heads up. Everyone out there has to just step up. Burnett praised the work of safeties coach Darren Perry and how he gets everyone ready to play. They’ll be depending on Perry, a former safety himself, even more now. You can count on one hand the number of current Green Bay Packers who have played at Houston’s Reliant Stadium. Only one was with the team the first and only time the Packers played at Reliant Stadium in 2004, and that was WR Donald Driver. Coincidentally, that was also a prime-time Sunday night game. The other three are veterans who played in Houston while employed by other teams. C Jeff Saturday has the most experience in the stadium, having played several years for the Indianapolis Colts, an AFC South rival of Houston’s who would travel to Reliant Stadium every season. Also, CB Charles Woodson played against the Texans in Houston in 2004 as a member of the Raiders, and DL Ryan Pickett did the same in ’05 while with the Rams. RB Cedric Benson played in Houston as a member of the Bengals in 2008 and in the AFC playoffs last season, but Benson is now on injured reserve.